The tradition is as old as the written language and is practiced in many cultures. 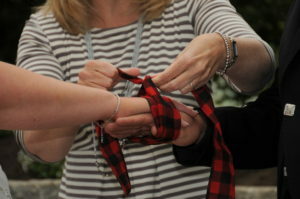 The term ‘hand fasting’ comes from the old custom of formally uniting a couple by binding their hands together with ribbon or cord. This is where the terms ‘giving one’s hand in marriage’ and ‘tying the knot’ comes from. 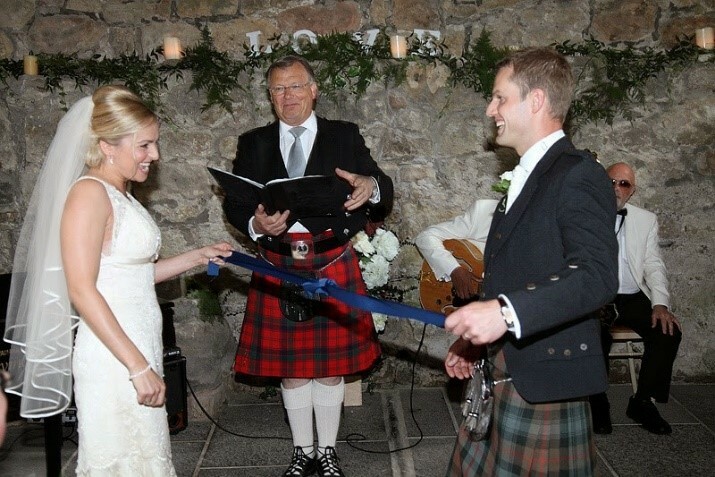 There are several ways the hand fasting can by carried out and your celebrant will discuss this with you. One method requires two pieces of material or cord, each about 1 ½ yds (1.3mtrs) in length, such as 2” wide satin ribbon or any material 2”-6” wide as long as it is not too thick, such as a heavy woollen material. During the pronouncement when the celebrant says the word “husband” the couple lift the tails and pull them with their left hands whilst simultaneously slipping their right hands apart, hence tying the knot. There are also lovely passages of prose that accompany the hand fasting, one of which is included below. Again your celebrant will guide you through this.